After lunch we’re herded back on the van for the trip back to Beijing for some shopping time at the famous Pearl Market - one of the largest markets in Beijing. The market began as a “spontaneous “street market around the foot of the wall of the Temple of Heaven. 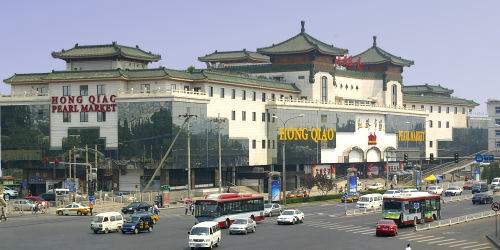 In 1992 when they started “modernizing” that section of Beijing, the market was moved into a modern five story building containing hundreds of aggressive venders. Inside the market you can find everything from clothing, silk, shoes & hats, suitcases, watches , knock-off electronics (can you say “IPoo?”) up to and including expensive jewelry (hence the name). I decide to attack the building starting at the top floor then work my way down. The first three floors take me about five minutes. 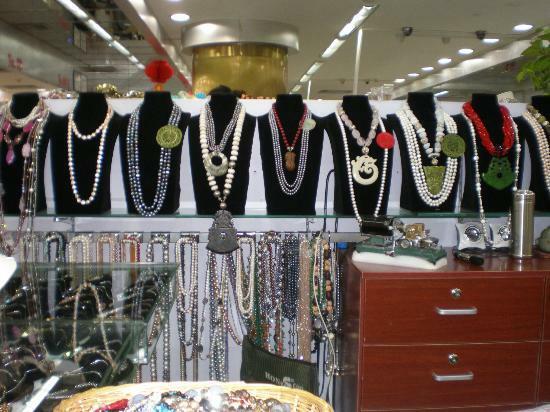 They consist of well-appointed high end jewelry venders – no cheap stuff here – also – not many people. But when I arrive on the second floor things change: that’s where you’ll find the cheap clothing, shoes and handbags. As I walk by the booths I try to avoid eye contact – keeping my eyes on the floor or straight ahead. If you show even the slightest interest in anything, the venders will dart out like piranhas that smell blood in the water. They actually grab you and pull you into the lairs and won’t let go until you buy something. I accidently glance up at a t-shirt. “You like that t-shirt?” the vender asks scooting out of nowhere blocking my path. “What t-shirt?” I counter trying to move around her. Big mistake, I’ve engaged in a conversation. In the venders mind, this is not a conversation; this signals the beginning of negotiations that can only end with her selling me something – anything! “What size you?” she counters ignoring my question and again blocking my progress. “You look like a large maybe?” she says pulling of a particularly ugly t-shirt and holding it up against me. “I don’t like it,” I protest. “No, no thank you,” I say turning to walk away. She affixes herself to my arm like a fresh water lamprey. “Okay! Okay! Special price for you! 100 Yuan,” she says holding up a calculator with the price on it. She grabs another one and thrusts it at me. She thrusts the calculator into my hand. “You tell me. How much? I know this game. I’ve been warned. If I answer a price and she accepts I’m stuck with a t-shirt I don’t want. “I don’t need any t-shirts,” I say firmly giving her back and her calculator and begin to walk away. With a speed that amazes me she darts in front of me and blocks my way. A confused look crosses her face. I smile – I have her. For a moment I think I’ve won. She turns and has a brief conversation with one of her co-worker, then turns back to me. It would normally be nirvana to me as I’m a sucker for this stuff, but I’ve been warned by my son, who’s been here before, that most of the stuff may look good, but it’s junk – with a working life-span measured in minutes). Still, I want to see what’s there, so I dive into the crowds. 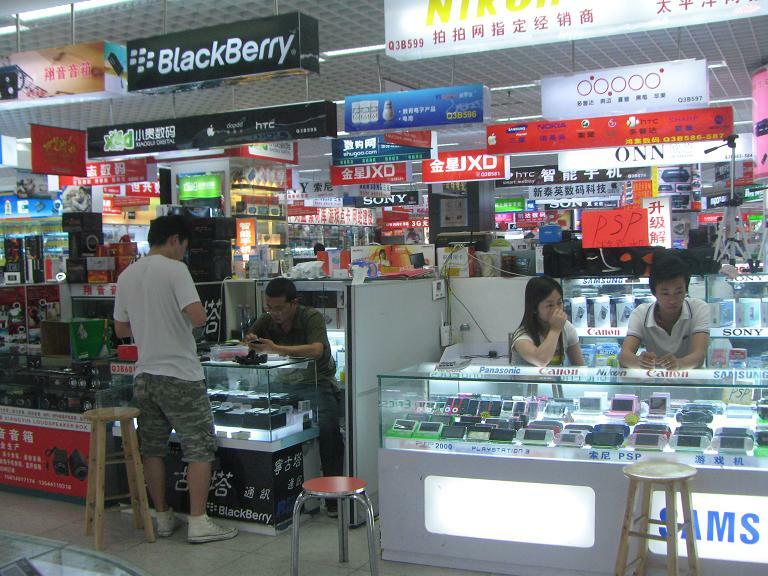 I stop at a booth where they're selling cell phones. I’m amazed to find a Samsung Note 7 in the display case. The vendor catches me looking at it. I depart before he can reply. My son warned me that they’ll often show you a “working” phone, then when you agree to the phone they do a switch when you put it down and take out your wallet. You get a model that might work for a short time, or even a model that has no guts. So if you’re going to indulge, you’ve been warned. I finally move to the basement where there’s a Food Fair and beer stand. The two Scottish couples are sitting at a table drinking pitchers of beer. 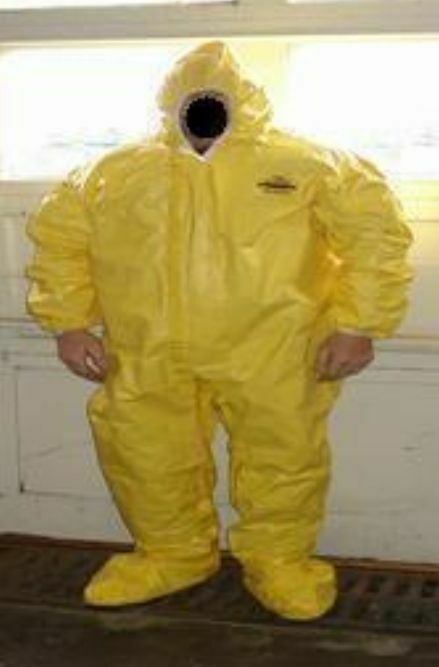 “Just this spiffy bio-hazard suit,” I reply holding up the yellow bundle. “What on earth do you need a bio-hazard suit for?” one of them asks. Eventually the rest of our group arrives at the table laden down with merchandize they don’t need and soon will regret. But who am I to burst their bubble? When the last one straggles in, Fong herds us back onto our bus for the trip to the train station and the night train to Xi’an. She’s booked us into second class soft sleeper. 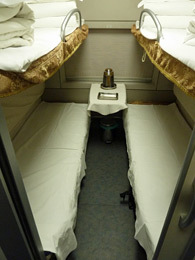 These are compartments with four bunks inside. I haven’t been looking forward to this part of the trip as I’ve had experience with “night trains” before in Asia – and it wasn’t a pretty picture. On one memorable trip in Vietnam, a touring group of Australians in the “hard” seats in the next carriage used our carriage as a vomitorium. The main problem with the night trains I’d previously experienced were the toilets. The good news is that each carriage had two washrooms – one of them being a western style toilet. The bad news on these trains is that about one hour into the journey they’re unusable and the smell of urine drifts into the carriage making the air unbreathable. However, this isn’t the case on this train. Here the washrooms are clean, and the attendants are constantly working to keep them that way. The other problem is being locked into a room smaller than a jail cell with three strangers. The rooms are small - maybe ten feet by ten feet - four bunk beds, and basically nothing else. If you want to use the washroom it’s at the end of the carriage. I’m assigned a compartment with the couple from England, and the Russian woman. It’s amazing how quickly you bond in tight quarters. In a short time we are sharing food and drinks. Later it will be farts and snores. On the positive side, it’s beats travelling coach in an airplane. At least here you get a nice soft bed and duvet. The births are at least eight feet long and there’s room to stretch out. Try that on an airplane - so I shouldn’t really complain. 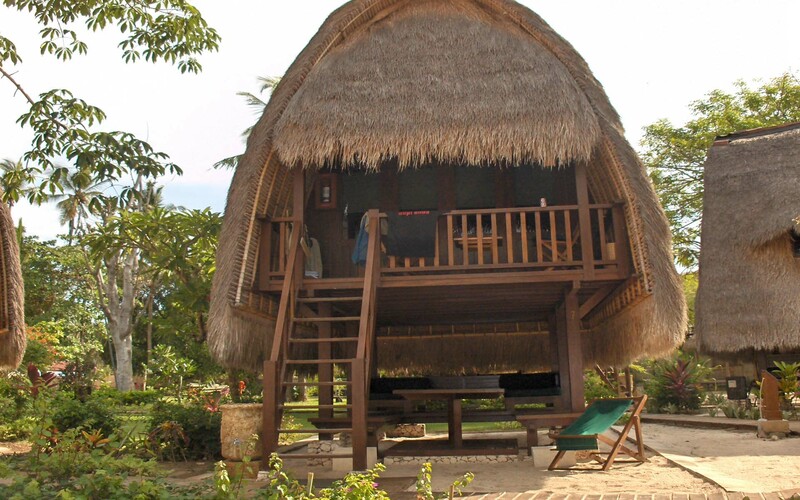 I have a comfortable bed, beer, good companions…. But I miss the curling. Tomorrow Xi’an and the Terracotta Warriors.